The professor then picked up a box of pebbles and poured them into the jar. He shook the jar lightly, and the pebbles rolled into the open areas between the golf balls. He then asked the students again if the jar was full. They agreed again that it was. 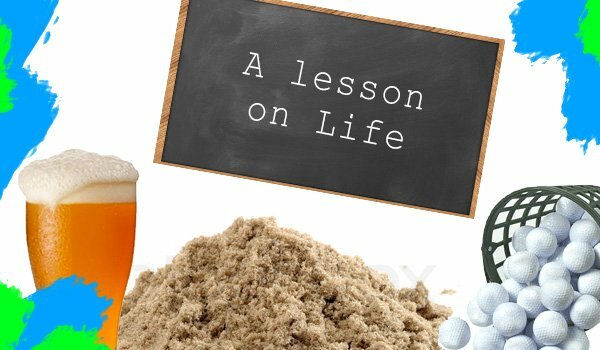 The professor then produced two pint glasses of beer from under the table and poured the contents of both into the jar, effectively filling the empty space between the grains of sand. The students laughed. The pebbles are the other things that matter like your job, your house and your car. The sand is everything else – the small stuff. You ever just stumble into something too good to be true? Well, that happened to me last week when I was in Newport NewsVA to visit my 93-year-old grandmother. After flying cross-country all day, I checked into my hotel at 9:30 pm tired, thirsty and famished (I love ya Southwest, but man cannot thrive on peanuts and water alone). I figured I’d be eating out of a vending machine that night, but asked the gal at the front desk if she knew where I could grab a bite that late on a Tuesday night. 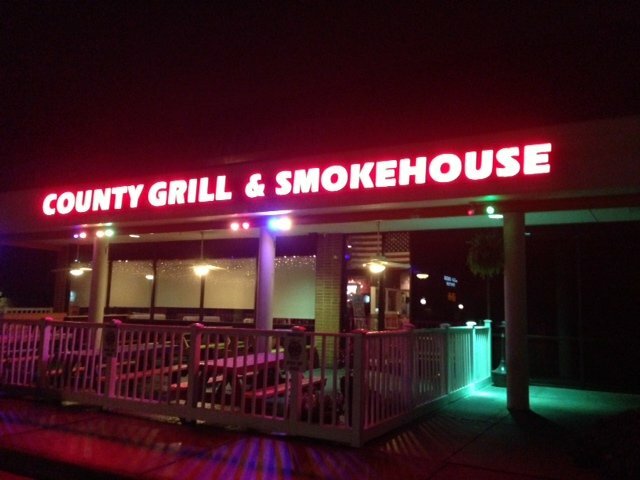 Without hesitation, she told me I needed to head over to The County Grill, “Some of the best BBQ in the state, hell, in the country”. “Okay”, I said,”But I really need a place that has good beer too”. “That’s the place for you Mr. Calef”, she confirmed. “Best beer selection for a hundred miles”. I was sold and drove a mere 3 blocks to my destination. Scotty dealing some fine beers on a Monday night. I bellied up to the bar and surveyed the beer list which was indeed impressive with such rarities as Hoppin’ Frog’s B.O.R.I.S. The Crusher, a 9.4% Russian Imperial Stout, and Smaltz’s Rejewvenator, a Belgian Dubbel-German Doppelbock hybrid, brewed with dates and figs. Started off local, with a nicely crafted American Porter from the St. George B.C. and moved directly into Stone’s Enjoy Before 5-17-13, a 9.4% imperial IPA (I needed to wind down a bit after the long day. It did the trick). I was now primed for the BBQ and ran with what they’re known for, their pulled pork sandwich…It did not disappoint. 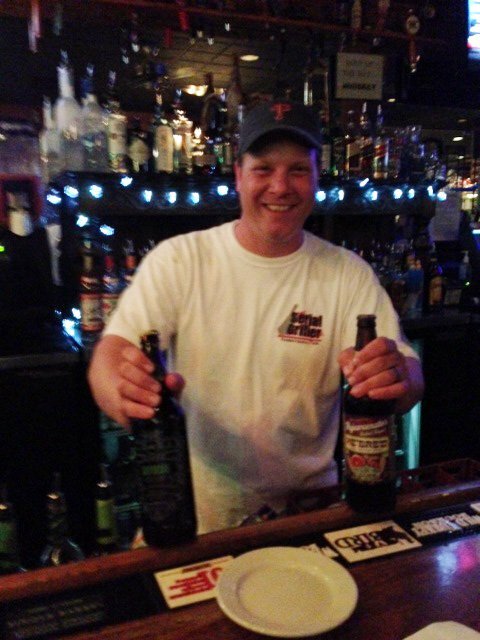 Guiding me through the extensive beer list was Scotty Batten, their well loved and very knowledgeable bartender. 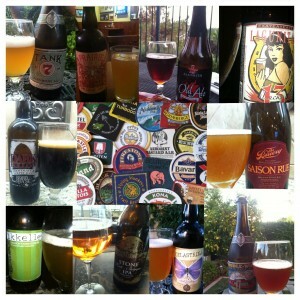 Over the night I shared who I was and it turned out that he’s a current member of our Domestic-International Variety Beer Club. Gotta love that. All in all a memorable night…Enough so that I dragged my sister Annie and cousins back the following night.